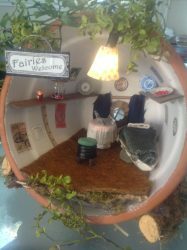 It’s a Small World: a 3 day workshop creating miniature dwellings or shops. Looking for big imaginations to create little worlds! Do you love books or films like ‘Epic’ (2013), Studio Ghibli ‘s ‘Arrietty’ (2010), ‘Stuart Little’ (1999), ‘Arthur and the Invisibles’ (2006), Tinkerbelle, or the ‘The Borrower’s’? Do you like to really get stuck into a creative process? Well, then this workshop could be the perfect opportunity for your intelligence to have some fun! 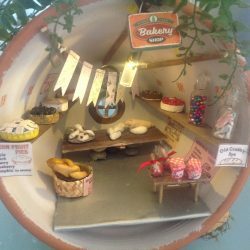 Students will explore their imaginations to create a mini dwelling or shop of their own. Using a clay garden pot as the base to design out from, they will look at using a combination of found objects (such as recycled bottle caps or containers, old costume jewellery, watches, stamps), organic materials (rocks, sticks, shells, etc. ), and craft materials (air-dry clay, beads, popsicle sticks, wire, fabric, paint, etc.) to layer up and build their own mini space. They will be taking on the challenge of designing ideas “to scale” and then figuring out how to create them (problem solving). They will also be soldering together their own battery operated mini light element to add another layer to their creations. Each student will leave with a complete dwelling or shop with battery operated light to take home. You need to bring your own morning tea and lunch for each day. Please wear old clothes and bring an old tshirt or apron as you will get a bit messy. I was born in Palo Alto, California in 1965. I grew up on the West coast of the U.S.A. Spending time in Denver Co, Oregon, and various parts of California. I always had an desire to paint and draw. My High School art teacher further fuelled this desire by entering my work in local art shows. I moved to Laguna Beach California after graduating. That was where I would start my journey as a Scenic Artist. With determination I knocked on doors and apprenticed where I could. I started with fine art, interiors, and hand painted textiles. Through the years I would continue to knock on doors and travel (my desire to learn and create never dying), that eventually lead me to Theatre and Film. It is Film (King Kong) that brought me to Wellington, New Zealand. I have continued to work in NZ and currently reside in Strathmore Park with my daughter. 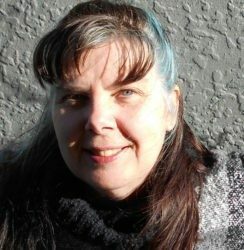 I now have 25+ years’ experience painting finishes for commercial and private interiors, Film (props and sets), Theatre, Casinos, themed environments, and Museums. I love sharing my passion and talent with young people who are keen to learn and create.